In this stunning and inspiring guide, Kate Rew, founder of the Outdoor Swimming Society, takes you on a wild journey across Britain, braving the elements to experience first-hand some of the most awe-inspiring corners of the landscape. From waterfalls and natural jacuzzis to sea caves and meandering rivers - every swim is described in loving detail, taking in the humor and glee of each mini-adventure and the breathtaking beauty of the surroundings as well as practical details about location and advice on swimming technique. With over 300 swim spots, it contains something to suit every kind of swimmer, from a five-year-old in water-wings to a seasoned cold-water connoisseur, or a rough and ready camper to a lazy-hazy summer picnicker. 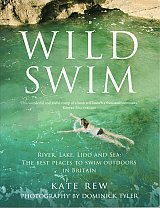 Beautifully photographed by Dominick Tyler, and with a fully comprehensive map, Wild Swim" is the definitive guide to outdoor swimming in Britain from the Outer Hebrides to the Isles of Scilly and everywhere in between."